The ACAMS Airfield Lighting control and monitoring system (ALCMS) allows the user to effectively control the various airfield lighting systems including runway, approach, taxiway, stop bars, apron etc. The lights can be switched off and on individually or in groups. The intensity can be controlled for specific lights according to preconfigured intervals. The ACAMS ALCMS can be easily adapted to interface to any type of airfield lighting equipment including a combination of equipment from different manufacturers. 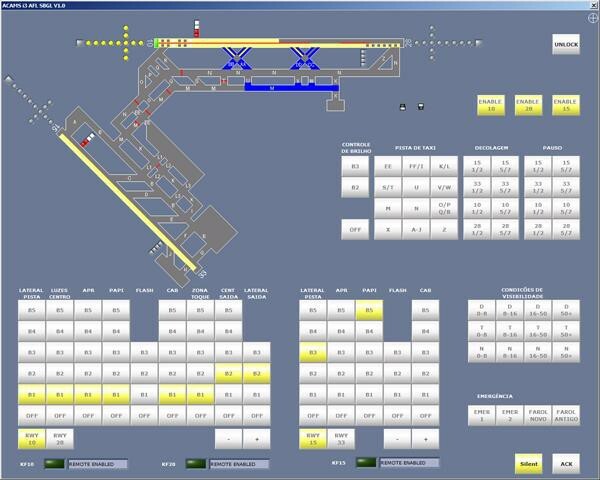 The control of several different airfield lighting systems can be integrated into a single homogeneous control panel with the ACAMS solution. The system can include monitoring of alarms related to the airfield lighting equipment and also other miscellaneous alarms. Data logging is available as an option allowing all operator activations to be logged and stored in a database providing valuable information in the case of an incident investigation. Industrial IP-based components are used to control the current regulators and power relays of the airfield lighting system. The components are interconnected using an Ethernet network with media converters to support long distances over optic fiber or copper cables. Operator panels with COTS equipment allowing the use of the latest state of the art touch monitors thereby providing the best Human Machine Interface. Individual lamp (single lamp) control available for enhanced monitoring and control of stop-bars, lead-on lights etc. The system can be integrated with all known airfield lighting systems. The ACAMS ALCMS can be supplied as an integrated module in an ACAMS integrated tower solution or as a stand alone system. The flexible and versatile ACAMS ALCMS may effectively be used on existing airfield systems, thereby extending useful service. A modern HMI can provide a cost-effective solution to extending service life of outdated systems.